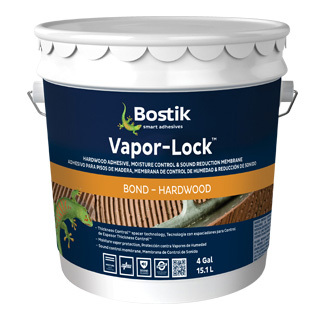 We are an authorized Bostik retailer. 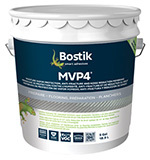 If you have any questions regarding any of Bostik products, please visit one of our showrooms or call our customer service. Vapor-Lock™ is a new and improved one-part, trowel-applied, rapid tacking, very low permeability moisture-cure urethane adhesive and vapor retarding membrane. This scientifically formulated adhesive/membrane does NOT contain any water, is virtually odorless, and has 0%-VOC's*. When applied as designed and cured, Vapor-Lock offers a tenacious waterproof bond to a variety of substrates and is not adversely affected by exposure to moisture, water, or alkalinity; it can also create a vapor-retarding membrane designed to reduce moderate amounts of moisture vapor transmission from the subfloor and bridge cracks that can occur in the substrate prior to or after installation (up to 1/8”).